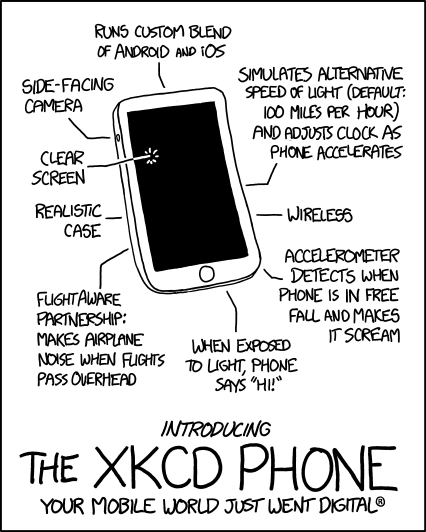 Today, we are sharing the latest comic from digital comic extraordinaire, Randall Munroe of xkcd. It’s a perfectly comedic take on our smartphones, but you’ll have to read the fine print to appreciate the sarcasm (below). Presented in partnership with Qualcomm, Craigslist, Whirlpool, Hostess, LifeStyles, and the US Chamber of Commerce. Manufactured on equipment which also processes peanuts. Price includes 2-year Knicks contract. Phone may extinguish nearby birthday candles. If phone ships with Siri, return immediately; do not speak to her and ignore any instructions she gives. Do not remove lead casing. Phone may attract/trap insects; this is normal. Volume adjustable (requires root). If you experience sudden tingling, nausea, or vomiting, perform a factory reset immediately. Do not submerge in water; phone will drown. Exterior may be frictionless. Prolonged use can cause mood swings, short-term memory loss, and seizures. Avert eyes while replacing battery. Under certain circumstances, wireless transmitter may control God. What do you think? We think, if a wireless device can indeed control the Gods, it is worth more than one Google Glass. Unfortunately, this is just a concept cartoon.